Fintech, as its name suggests, is the blending of traditional financial services with new and innovative technology. Businesses captured under the definition aim to provide financial services to customers through the use of technological mediums, like computer software tools. Naturally, such a broad definition includes a host of firms and products looking to provide customers with the most attractive, efficient and all-encompassing service they can. 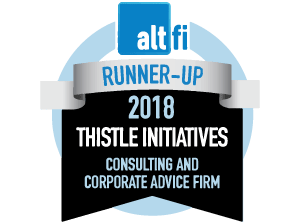 Thistle has been at the forefront of fintech innovations made over much of the past decade, helping firms launch products which are compliant and captivating, enabling them to provide a service which reflects their culture and goals. We pride ourselves on providing innovative regulatory solutions for new and exciting business models which may not have been previously introduced or launched before and are passionate about helping firms reach their goals. We support firms in a number of ways including applications to become directly authorised with the FCA, a range of compliance support and monitoring services for those who may already be trading, and varying project work tailored to business targets and needs. We work hand-in-hand with leading fintech firms and the FCA in navigating the regulatory landscape and being a source of expertise and guidance in formulating successful applications and robust compliance and regulatory controls.